He looked like a huge dinosaur, coming straight towards me. Everything felt like it was happening in slow motion. Me, staring directly into a huge, gaping mouth. Him, all 20 tonnes worth, slowly but deliberately gliding through the clear blue water, the metres between us quickly shrinking to just a few feet, every spot on his body quickly coming into focus. The sight of this gentle giant was mesmerizing, and I would have gasped were it not for the snorkel in my mouth. Instead, at what felt like the very last second, I turned my back to him and frantically flutter kicked. 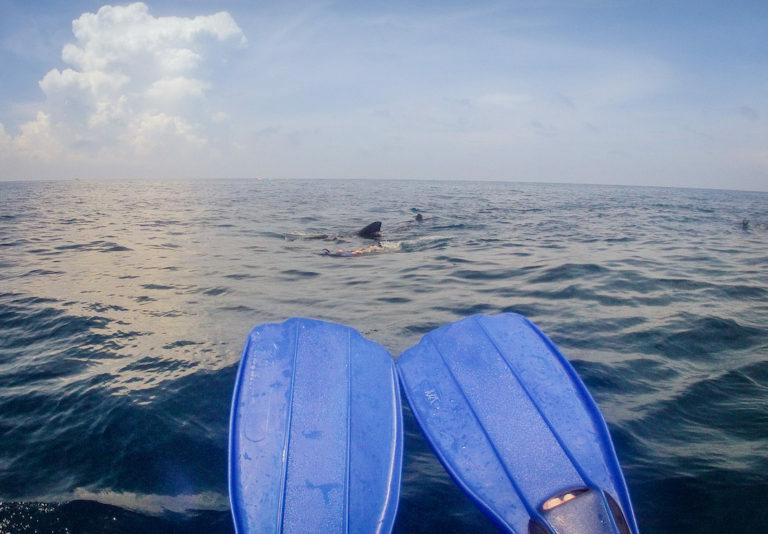 Kick, kick, kick, my heart racing a mile a minute as I swam with all my strength towards the open water, cognizant that his huge fin that could sideswipe me at any minute. It was all a blur. The neon flashes of other swimmers’ flippers ahead of me. The white bubbles their kicks stirred up. Sucker fish, the hull of a boat, and pieces of seaweed floating above my head. Then suddenly…nothing. I looked back, and he was gone, disappearing into the blue Caribbean Sea, more interested in plankton than a tourist. Confident I was once again alone, I finally brought my head above surface, surveyed the area for any sign of a silver fin jutting out of the water…then let out a whoop of delight. 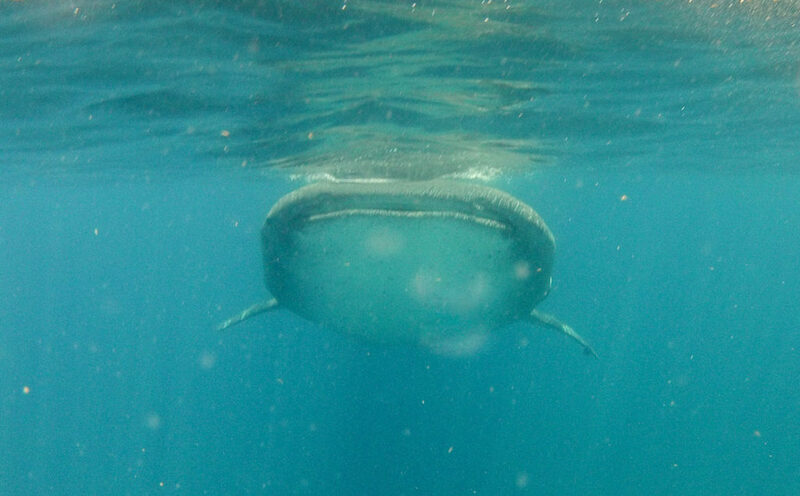 Surely there are few things in life more thrilling than coming face to face with a whale shark in all of his glory. Thousands of travellers head to Mexico’s Yucatán Peninsula every year for these special encounters, which happen between May and September. 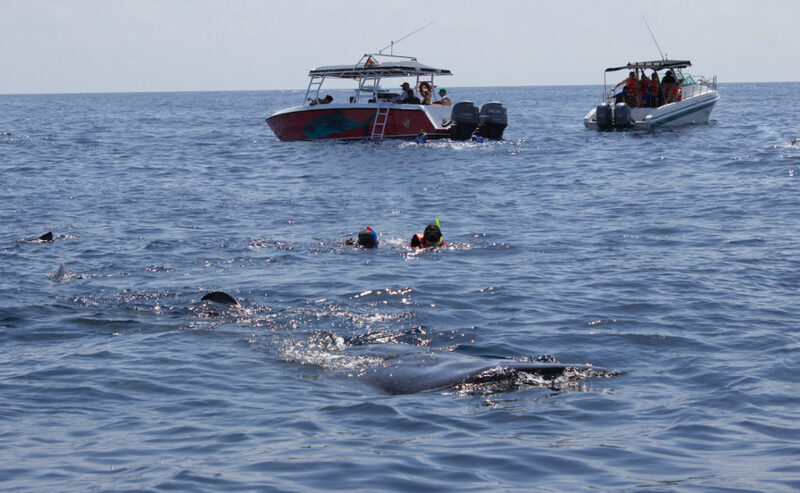 Dozens of tour operators offer whale shark excursions from popular spots such as Cancun, Playa del Carmen and Isla Mujeres—some companies reputable, others not, which is why my husband and I decided to make the trip up to Isla Holbox. 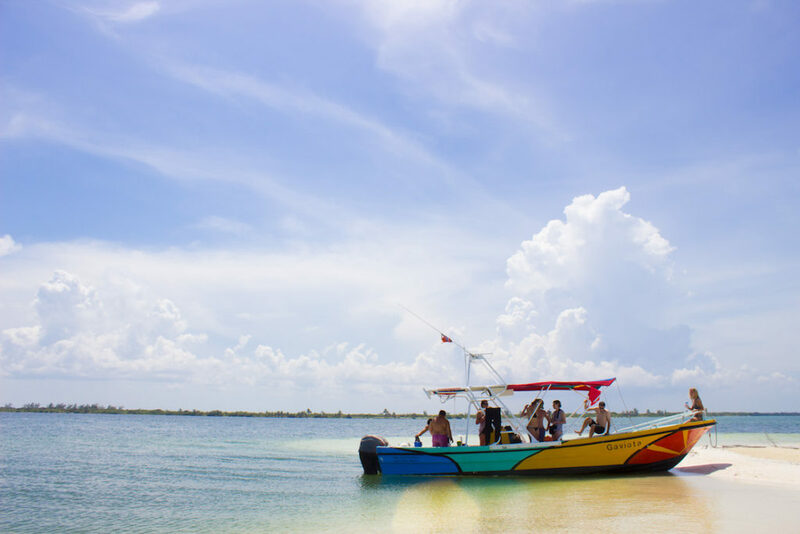 The colourful island is only a two hour drive from the Riviera Maya, yet feels a world away from the busy resort areas thanks to its laid-back vibe, the type of place where bicycles, scooters and golf carts are the only way to get around. 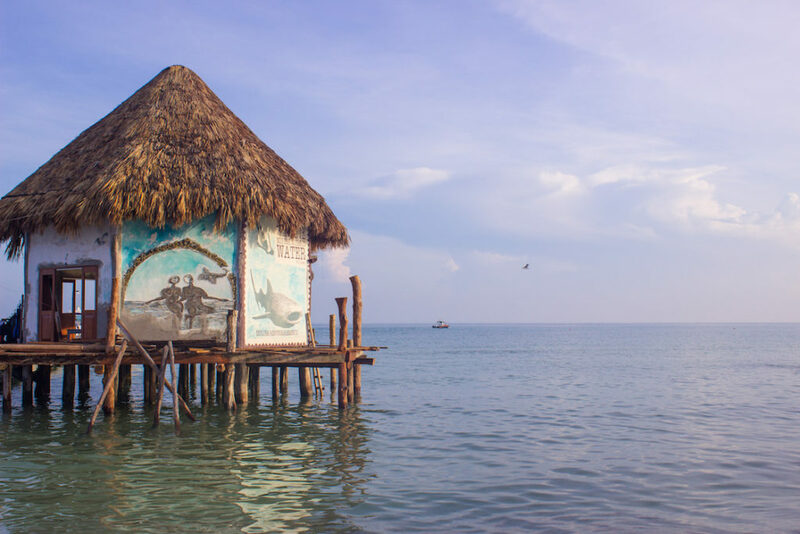 It’s also home to V.I.P Holbox Experience, the company my husband booked our excursion through after painstakingly reviewing operators to weed out those with suspect reputations, and “big box” companies that shuttle tourists through like cattle. V.I.P. Holbox Experience was the perfect choice, which was glaringly obvious throughout the day as we witnessed other tour operators drive boats dangerously close to the sharks, disregard the rules for how many swimmers are allowed to be in the conservation area at once, and speeding away after only an hour—leaving our group to enjoy the vast ocean and beautiful creatures all to ourselves. Visiting at the end of August meant it was prime time to see whale sharks, so our day started with an early 7 AM arrival at the company’s headquarters where we met the seven other guests we’d be travelling with. We enjoyed a light breakfast while our cheery guide Gustavo handed out equipment and walked us through the day’s itinerary which would include a two hour boat ride each way, plus multiple stops for wildlife viewing, snorkeling and beach time. From there it was a quick walk to the dock, and we soon found ourselves speeding away from tiny Holbox into the vast, aquamarine sea. 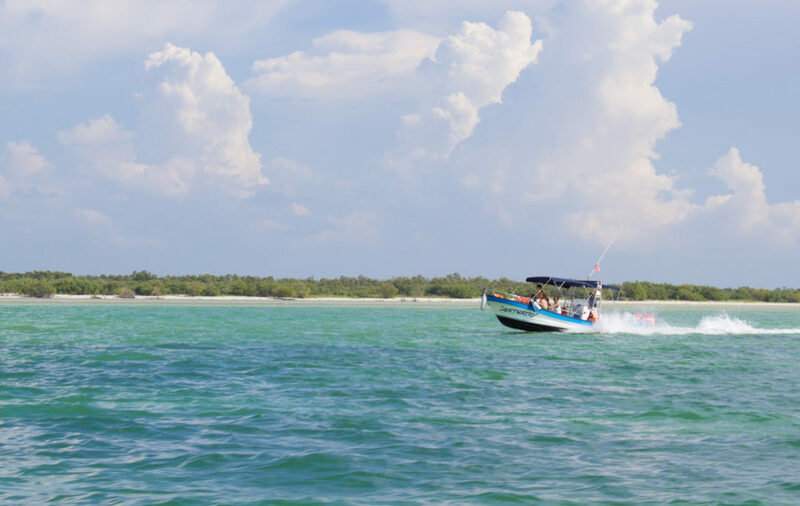 It didn’t take long for the wildlife spotting to start: just a few minutes in, dozens of tiny, pink specks appeared in the shallow water near the shoreline, and our captain Trino swerved the boat towards them. Sure enough, it was a group of often-elusive flamingos—another reason we’d chosen to book our tour from Holbox, which is one of the only places in Mexico to spot them. 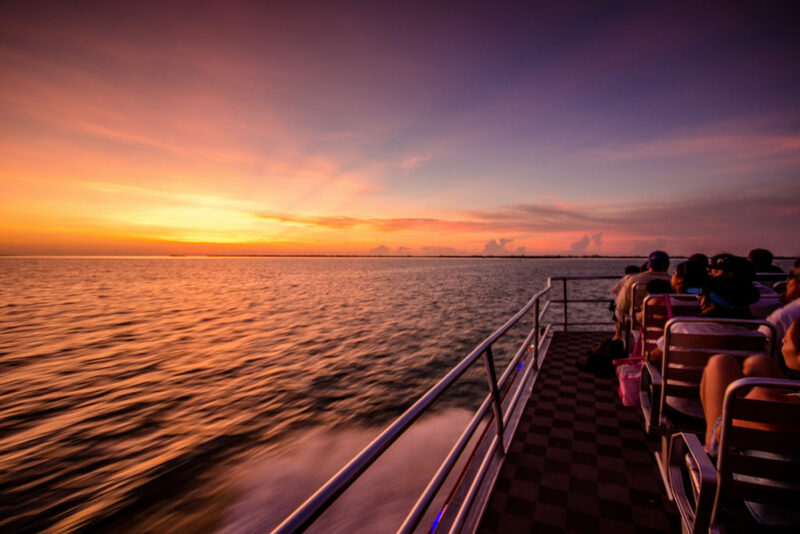 The effects of the Dramamine I’d taken that morning to ward off motion sickness were setting in, and I found myself dozing off despite the staccato bumps of the boat speeding over the waves. I briefly woke up during a quick stop at an island occupied by only one family, which supplies boats like ours with fresh fish. Still in a daze, I watched Gustavo hop back into the boat, holding a two-foot long fish with his bare hands that looked like it had just been plucked out of the sea. I rubbed my eyes to make sure I wasn’t dreaming, and my stomach growled in anticipation of the ceviche we would later be enjoying—surely the freshest any of us had ever had. Another hour or so passed before we finally made it up to Agua Azul just east of Isla Contoy, and were surprised to find the area swarming with boats just like ours. There had to be at least 40 of them, and one woman we were travelling with mentioned she’d heard there can be up to 150 boats at a time in some areas. 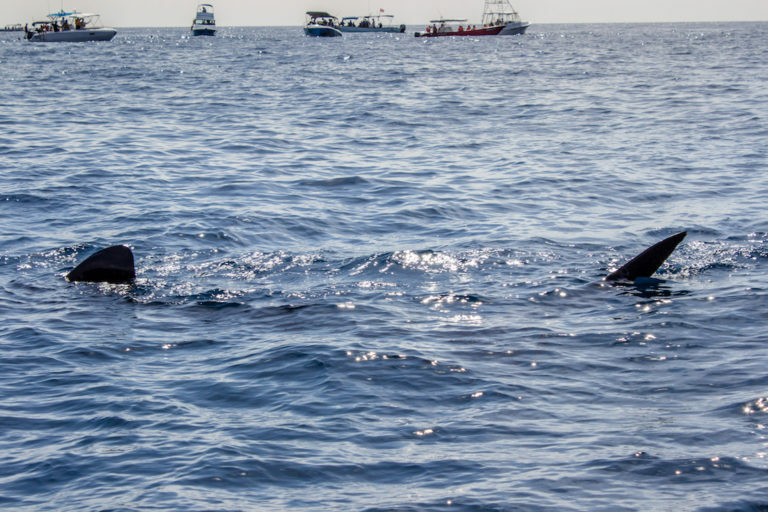 Fortunately there were more than enough whale sharks to go around, and we were amazed to almost immediately spot a dark fin popping out of the water about 30 feet away. We all pointed at it excitedly while pulling out our cameras, and the first couple threw on their snorkel gear and jumped into the water with Gustavo, heading straight towards the shark. Now, there’s no question the idea of swimming with a whale shark sounds unnerving, particularly because they’re typically up to 40 feet long and weigh an average of 20 tonnes. Fortunately there’s absolutely nothing to be afraid of, as the fish much prefer a vegetarian diet of plankton. The gentle giants are completely harmless, and even if they were to accidentally swipe you with one of their large fins (which happened to one gentleman in our group who wasn’t able to swim away quickly enough) it’s akin to being hit with a large, rubbery eraser and doesn’t hurt at all. With this in mind, no one in our group hesitated to jump in—save for one incident later in the day where I nearly landed directly on top of a shark, who suddenly veered towards our boat just as I was about to hop in!